I’ve heard of people making tofu scrambles for breakfast or as a side and never realized how simple the dish was to make until I tried it myself. I used a tip from a friend who told me to freeze the entire block of tofu prior to making the scramble. Freezing tofu changes its consistency and texture, making it more firm and dense. When crumbled, it tastes great.I made this recipe up myself so feel free to add any additional vegetables (such as mushrooms), sauces, or herbs. 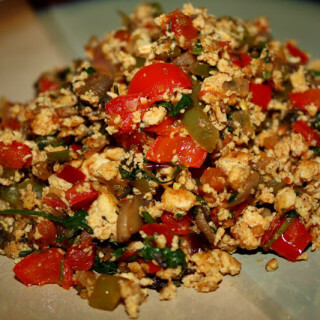 This recipe is a mexican version of tofu scramble. It tastes great as a side or for breakfast. 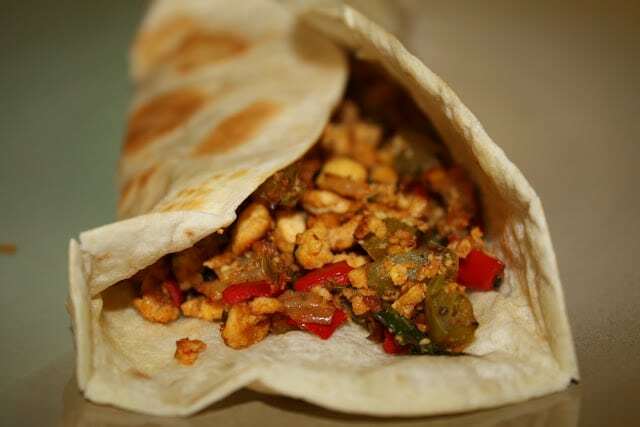 You can also grill either flour or corn tortilla and use the scramble as a filling. If you’re using flour tortilla, I highly recommend uncooked flour tortillas from Canasta, they taste so much better than any other packaged flour tortilla brand I’ve tasted so far. You can find these uncooked flour tortillas at Sprouts and Ralphs. You can also purchase these tortillas directly on the Canasta Uncooked Flour Tortillas website or on amazon. Get creative as i’m sure there are many versions of a tofu scramble!! 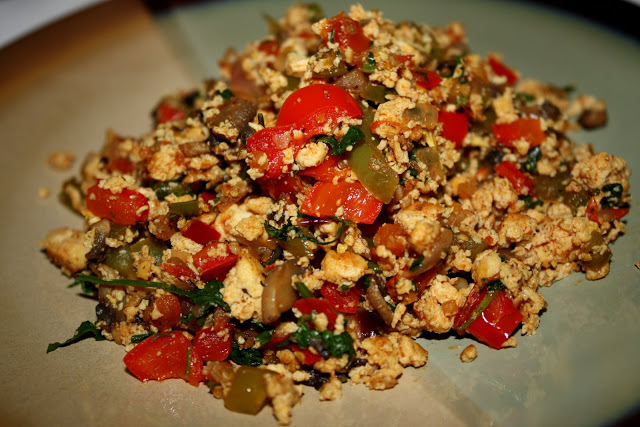 Find out what makes this particular tofu scramble different than the rest! Unbelievable unique textured tofu combined with a Mexican flare! Cut tofu block in half. Drain the tofu with paper napkins in order to remove the excess storage liquid (without breaking up the tofu). Once the tofu is drained, place it in a freezer bag and store in the freezer. Freeze overnight or until you are ready to use it. Remove from the freezer and and thaw completely in the refrigerator. You will notice the change in consistency of the tofu after it has been frozen. When soft, press any residual water with a paper napkin. Add 2 tbsp oil in a wok or skillet and heat to medium. Add chopped garlic, onions, and red/green bell peppers and saute on medium/high heat until they are cooked. Add some salt and mix. Defrost and add the corn. With your hands, crumble the tofu block and add directly to the skillet. 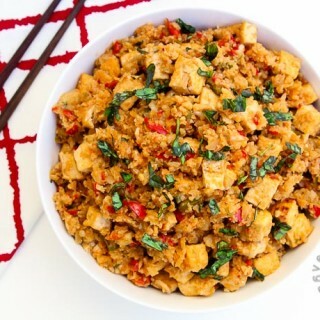 Mix the scramble frequently and cook the tofu until it has slightly browned. Add taco seasoning, hot sauce, and salt to taste. Add freshly chopped basil or cilantro. If you don't have fresh herbs, you can use dried herbs. Serve hot. You can eat this scramble by itself, or grill tortilla and make a wrap using this scramble as a filling. Many store-bought taco seasoning is not gluten-free. For a gluten-free version, instead of using store-bought taco seasoning, use a combination of any or all of the following spices: chilli powder, paprika, salt, onion powder, cumin, cayenne pepper, garlic powder, ground oregano, and sugar. Made this one last week when Roshni and Pari came over! It was really easy! I was a little worried that it wouldn't come out good because this was my first time working with tofu, but it was a hit! We sprinkled some cheese on top and wrapped them in torillas! I made this for lunch. It was so quick and easy to make! I never thought to make it with these ingredients, it tasted much better with the tofu scrambled rather then usual way that I keep tofu cubed. The taco seasoning was a key part! I added avocado on top with some salsa and sour cream. Def. going to be one of my go to meals now! Yay so glad you liked it! 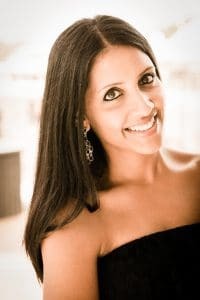 This is one of my go-to meals as well! Especially if I have a bunch of veggies in the fridge that need to be used up. I always keep one block of tofu in the freezer so I'm ready to make this dish anytime! Try making this dish keeping the tofu cubed as well...I used to eat it scrambled all the time and then one time tried this dish keeping the tofu cubed. I actually now prefer the taste and texture of the tofu cubed in this dish! Thanks for visiting the site! This was amazing-perfect for Sunday brunch! I added black beans, salsa, and jalapenos to the tofu mixture. Instead of taco seasoning I made my own seasoning using cumin,paprika,black pepper and oregano. Thank you for the comment! So glad you liked it! Your version of this dish with black beans sounds great - I'll have to try it out next time! I made this as a part of brunch for my family the other day and it was a hit! I had never frozen tofu before and really liked the texture it gave to it. I added some ancho chili powder along wit the taco seasoning to give it a bit of a smoky flavor and served along side hot corn tortillas. Everyone loved it and there were no leftovers! Awesome...so glad to hear it was a huge it! When i first discovered the great texture frozen tofu gave, it was fun to experiment and create this recipe. It's one of my favorites, and very healthy. I'll have to try adding ancho chili powder next time...thanks! I'm hoping to come up with another tofu scramble recipe soon. Thanks for the feedback! Made this by itself was very filling but think would taste great in a tortilla too! I liked the texture of tofu after freezing it! I totally agree...love the different texture after freezing (which reminds me I need to develop another recipe using this type of tofu)! I haven't made this dish myself in awhile...now you have me craving it =) Thank you for the comment!! I followed your recipe pretty much exactly except I added a can of fire roasted tomatoes. I then used it to make breakfast burritos, adding some cuban style black beans and roasted red potatoes. I cannot begin to tell you how good they came out. Absolutely delicious. I ended up with 11 burritos which I vacuum sealed and froze, thinking I'd have a quick breakfast at my disposal for the next month or two. I ate them all in one week, they were that good. Thanks so much for this awesome recipe. Oh wow! that's so awesome...your additions sound wonderful! 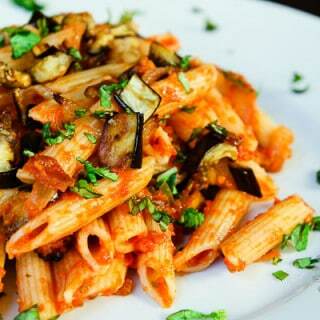 You reminded me that I need to do another revision on this recipe and how much I love it! Haven't made it myself in awhile. At least they were quick meals for that month! I've never tried making a bunch and freezing them...great idea! Thanks for trying it out and the great feedback!